Hunterdon Hills Playhouse, set in the scenic rolling hills of Hunterdon County, New Jersey, is a unique and romantic venue ideal for wedding ceremonies. When visiting our location, prospective brides and grooms are often pleasantly surprised at how truly spacious, picturesque, and charming our venue is. After a visit, many couples choose not only to hold their ceremonies here, but their receptions as well. Offering a variety of distinctive sites both indoors and out, our venue gives couples multiple choices from which to exchange their vows in front of loved ones. Our lush and airy Atrium Room, with its vaulted ceilings, floor to ceiling windows, and skylights brings the natural beauty of the surrounding grounds indoors. The stone terrace, with its large beautiful white gazebo, overlooks our shimmering lake, combining country charm with romantic elegance. 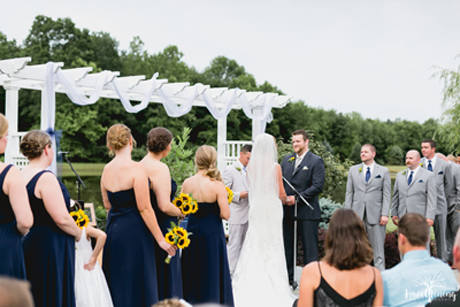 Lakeside ceremonies are held on our stone patio in front of our expansive white trellis, which can be decorated with garland, flowers, and decorative tulle. 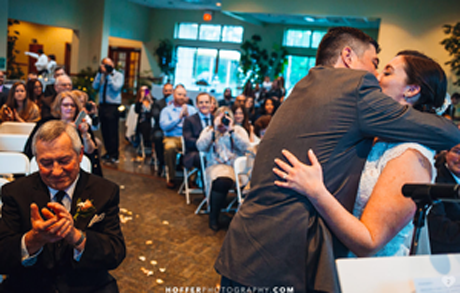 At Hunterdon Hills Playhouse, you can be assured of an unforgettable experience within a truly novel setting, along with the incomparable convenience of being just steps away from the next activity on your Wedding Day itinerary!